Archbishop Blase Cupich After celebrated his first Palm Sunday Mass as head of Chicago's archdiocese at Holy Name Cathedral. CHICAGO (WLS) -- As Francis Cardinal George remains hospitalized Sunday evening, there were prayers for his recovery during Palm Sunday Mass at Holy Name Cathedral. The cardinal was re-admitted to Loyola University Medical Center Saturday, several months after he stopped treatment for kidney cancer. He was scheduled to be treated there for de-hydration and pain management. 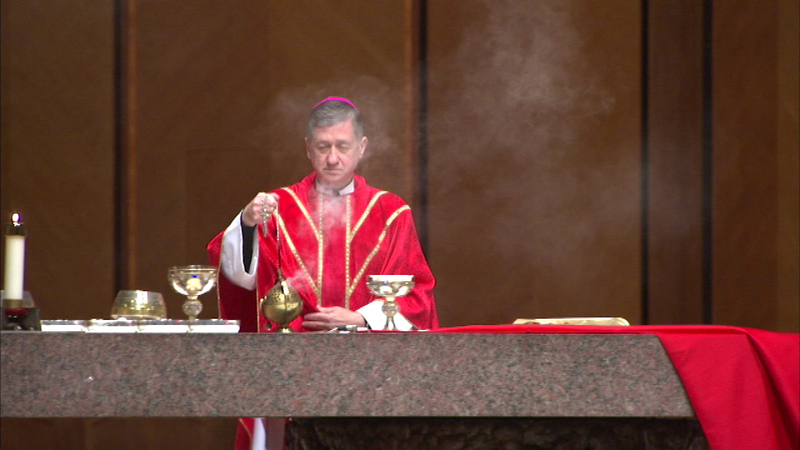 After celebrating his first Palm Sunday Mass as head of Chicago's archdiocese, Archbishop Blase Cupich talked about visiting the cardinal. "He was very good to talk to as he always is," Cupich said. "One of the things I have to say about the cardinal is every conversation we have he always ends up by saying, 'You're doing a good job. Keep up the good work and I'm so happy you're here." And he's asking me how I'm doing." In a statement, Cardinal George said he is grateful for all the prayers sent on his behalf.